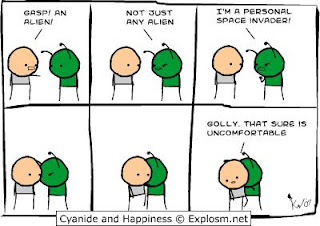 Idiom: personal space; used as a noun. Erica: Matt is so weird! He's always invading my personal space. Christina: Me too! He always stands too close. Do you think he just does it to girls? Erica: I don't know. Let's ask Tom. Hey Tom! Christina: Erica and I have a question. We noticed that Matt sometimes gets a little too close. Does he do that to you as well? Tom: Yes! He apparently doesn't understand what personal space is. Meaning: "Personal space" is an invisible border around a person that is considered unacceptable to cross. While the exact size varies by person and culture, most people feel uncomfortable if someone else stands closer than approximately 2 feet from him/her. In the above example, Erica, Christina and Tom all agree that Matt often stands too close; most likely, Matt's idea of personal space is just smaller than theirs. Notice that Erica uses the verb "invade" to describe the way Matt crosses this invisible line; most people think of the area directly around themselves as their own, personal space, and it is an invasion of privacy to cross it. Daniel: I hate the subway after work! Daniel: Everyone is so crammed in there. 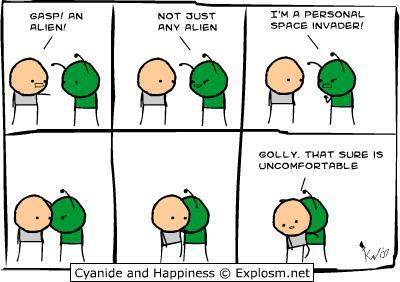 I get claustrophobic*. Helen: Weird. I hate when other people invade my personal space too, but it doesn't really bother me on the subway. I guess it's because I know it's not their fault. Daniel: You're lucky. I flip out when strangers are that close. *claustrophobia is a fear of small spaces. Meaning: In this case, Daniel and Christina are talking about the crowded subway. For most people (like Helen), personal space invasions don't bother them as much when it's caused by a crowd; however, some people (like Daniel) are so bothered by personal space invasions that they become frightened.